…the palm industry’s rapid expansion is yielding new evidence of a boom that benefited from the displacement of small farmers, indigenous groups and others by the armed conflict. Several of the regions where palm has spread during the past decade are places notorious for paramilitary violence and rural terror, like the north coast outside Cartagena, the Venezuela border region and the southeastern plains of the Meta department, where Mapiripan is located. As the government and the country’s largest rebel group, the FARC, now attempt to reach a peace accord to end the fighting, Colombia faces the painstaking task of trying to sort out what happened in Mapiripan and other places like it, and how to move forward. Central to the dispute is a clashing vision of rural development, between the traditional model that has been partly destroyed by the violence and an agribusiness vision that promises growth, jobs and modernization through the spread of commodity crops like African palm. This entry was posted in Uncategorized and tagged animal, colombia, labour, oil, palm oil on December 30, 2014 by Steven Bodzin. So, the US is imposing a few more targeted sanctions on a few more people from Venezuela. There are a lot of reasons to oppose this sort of measure, but I continue to hear the blah blah of how oh no, now the Venezuelan government (or “regime,” as they say) will blame the US for all its problems. David Smilde, of the Washington Office on Latin America, wrote a pretty scholarly piece trying to support this claim, in the form of a long argument against a ranty kvetsch of mine from a few months back. This entry was posted in Uncategorized and tagged cuba, trade, usa, venezuela on December 18, 2014 by Steven Bodzin. Ken Silverstein, one of the great long-standing US investigative reporters, has aimed his razor skills and obsessive memory upon the offshore anonymous corporation game, and especially the law firm Mossack Fonseca & Co., of Panama. A tour de force of reporting, fully worth reading, at this link. Since the 70s the law firm has expanded operations and now works with affiliated offices in 44 countries, including the Bahamas, Cyprus, Hong Kong, Switzerland, Brazil, Jersey, Luxembourg, the British Virgin Islands, and—perhaps most troubling—the US, specifically the states of Wyoming, Florida, and Nevada. That just gives a hint, please go read it, it’s the sort of education that you need if you want to know how power and money really work in this world. This entry was posted in Uncategorized and tagged panama, scams, usa, zimbabwe on December 15, 2014 by Steven Bodzin. Here’s an oil-exporting country that is taking advantage of the low price of oil to eliminate subsidies. That may be a tough policy to maintain when prices rise again, but at least they are trying. You can see they did a reasonably good job of this transition by the fact that it hasn’t been in the news. No riots, no panic. Here’s a study of how the state sought public support for the change, then started it in 2013. This entry was posted in Uncategorized and tagged fuel price, fuel subsidies, gasoline, malaysia on December 10, 2014 by Steven Bodzin. The OECD has a new report about corruption. It gives people like me a good guide to where to look for scandal stories. 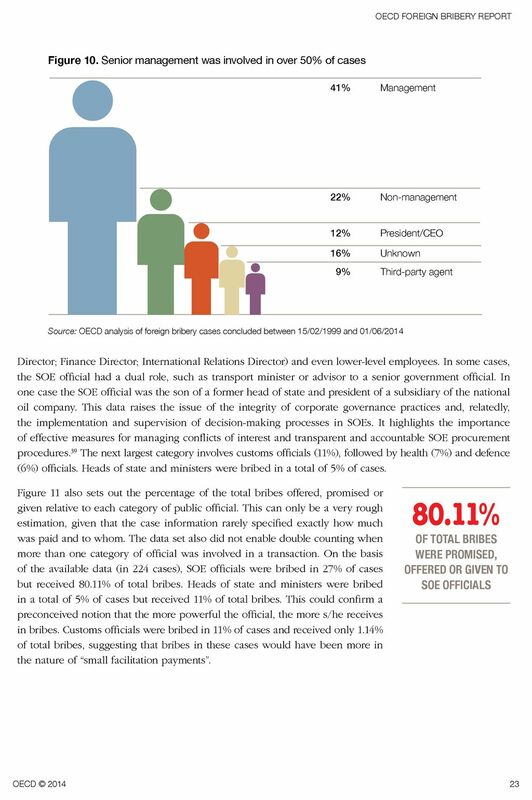 The OECD says state-owned enterprises are responsible for a huge part of the problem. Eighty percent of discovered cases of foreign bribery involved state companies. The natural resource industry is most vulnerable. Three quarters of cases involve intermediaries, many of them in offshore tax havens. State companies, natural resources, and intermediaries in offshore tax havens. Where could we find such things? Sounds like there will continue to be work for those of us interested in energy corruption stories in Latin America. Hat-tip to Global Witness for pointing out the new report. They want to help reduce corruption by pushing for an end to anonymous corporate registration. I think that will take some very concerted international cooperation. There is always some poor country that will want to whore itself out to corporations, whether as a tax haven, internet domain registry, or anonymous corporate registration hideout. Panama gets more transparent, along come Nevis and Mauritius. This entry was posted in Uncategorized and tagged corruption, oecd on December 2, 2014 by Steven Bodzin.